Remember the other day when I said that it was really rainy and the summer was pretty mild here in North Carolina? Well the storms are gone and the heat and humidity are in full swing. My hair and the humidity do not mix here and it is a hot mess! But on the flip side, I am able to BBQ again. And these Chipotle Chicken Kabobs turned out amazing! 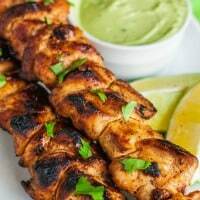 Deliciously grilled kabobs with amazing chipotle spice blend and avocado cream sauce for dipping! Whisk together vegetable oil, salt, chili powder, paprika, cumin, cayenne pepper, minced garlic, brown sugar, and chipotle pepper. 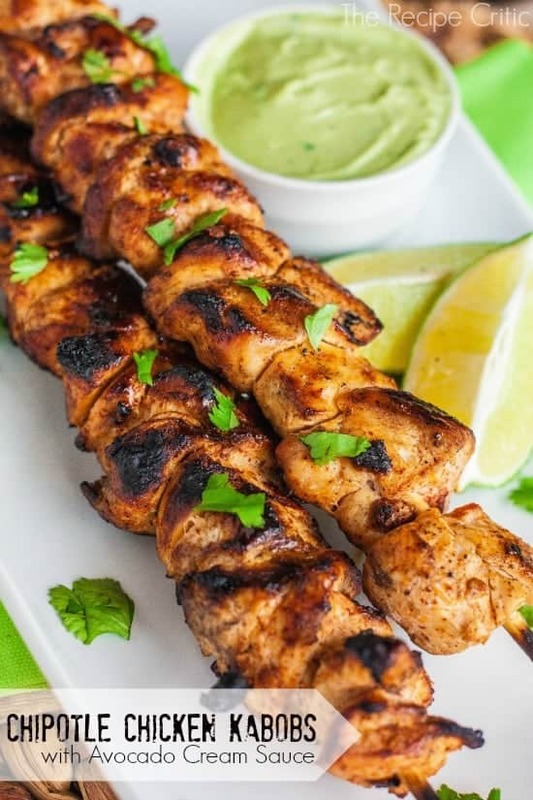 In a gallon sized bag combine marinade and chicken and refrigerate for 30-60 minutes. Once ready to grill, thread the chicken on skewers. Place them on the grill turning once or twice until sides are cooked and insides are no longer pink. Place on a plate and sprinkle with fresh cilantro if desired. In a food processor combine avocado, greek yogurt, garlic, lime juice and cilantro. Pulse until smooth. Add salt and pepper to taste and serve with chicken. This looks delicious! My kind of summer food. This was SO good! Very easy and I loved how good it was for us too. The Avocado cream sauce was so yummy and it tasted very much like the avocado dressing from Chick Fil-A and it’s much better for you too! Thanks for sharing this treasure, we will make this again for sure! That avocado cream sauce is my new go to sauce! Yum! I am too lazy for kebabs so I just used the marinade on chicken thighs. I also added about 1/2 a cup of greek yogurt to the marinade, which keeps the chicken VERY moist. Thanks for adding a new quick and easy recipe to my weeknight arsenal! I am all over that cream sauce!!! And the kabobs are gorgeous! These were fabulous. My husband (who is picky) and I, loved everything about this dish. I dont know were to begin, WOW This is the best chicken ever and the cream sauce is as well. Five stars are not enough try 100 stars. I have to admit one of the best avocado sauce i have ever tried…. thank you so much for this receipt.. Thinking of making these for a BBQ tomorrow. If I were to add vegetables to the skewers, would you suggest marinating them as well? Thanks! We loved them! I will make this one again! Definitely a keeper, and that sauce can be used on everything! Going to use it on burgers next! I’ve made this twice now, and everyone loves it! I just had to comment to thank you for posting this amazing recipe! I want to make this ahead of time and freeze it…do you think the sauce would freeze/thaw well? or should it only be made fresh? Thank you! Try it and let us know! I’ve frozen guacamole with great success. Turns out totally fine. 10! If I could give this a 100 I would! Since it’s winter in Minnesota I tweaked the dish to be a little more hearty and a full meal. I used half a rotisserie chicken I pieced earlier in the week and marinated that. Made some sticky rice, sautéed the chicken with two diced green peppers, a red pepper, an onion, and about a tbsp of minced garlic. Served in a bowl over the rice with a dollop of the avocado cream sauce and I died. Died of happiness. Then came back to life to eat more! I love you recipe author. Just know that!